Stay tuned for updated post on my most recent travels to Curacao. The Sulphur Springs of St. Lucia are remarkable and unlike any other tourist attraction I have visited. Although highly recommended by locals and frequently visited by tourists, including celebrities like Oprah, the springs are said to be rejuvenating, energizing, and a natural wonder. The springs are a result of the collapsed Soufrier Volcano which last erupted in the 1700’s and is now considered dormant. 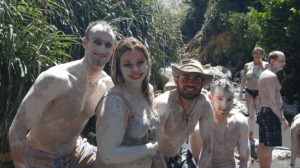 The mud baths are filled with minerals from the volcano and are suppose to help detoxify the body and provide relief to skin ailments such as sun burns, arthritis, and even ease sore joints, as well as decrease your age by ten years! While visiting the hot spring, you are instructed not to test the water but simply walk down the four steps into a shared pool. The water is not crystal clear, but rather a dark grey, smooth liquid that is opaque and slightly slimy. The temperature of the water is above 100 degrees and the heat is an initial shock, especially when the temperature outdoors is quite warm. After about three to four minutes, you are encouraged to step out of the pool and under a bridge where a gentleman is mixing the mud in wine-like pales. The mud is not brown but grey and rough. Tiny little grains make up the mixture and you are told to lather yourself and apply the mud freely. The gentleman encouraged all of us to apply it to our face and rub to exfoliate the skin. Unsure of what exactly was in the mixture, I was naturally hesitant but after feeling the softness of the mud on my stomach and thighs, I decided that I had already come this far and began to apply the mud to my face. The coolness of the paste was marvellous and calmed the sunburn forming on my nose. Friends who had joined me on the tour stood with me alongside of the creek as we dried out like prunes. The mud hardened in every crease of my skin making it feel painted. If I touched my face, tiny flakes of mud would sand off. A few moments later, we were ushered back into the same spring pool and we were able to rinse of. The natural minerals in the mud and water seemed to reverberate through my skin and into my muscles – I really felt alive. The pores on my skin felt renewed and I could not wait to look into a mirror to see the age-difference – after taking a selfie (lol). I realized that I was the same beautiful age and that the only permanent change was the massive smile on my face for having experienced another (in my opinion) natural world wonder. Once a sophisticated Roman city, Pompeii was buried in meters of ash and pumice after the catastrophic eruption of Mt. Vesuvius in 79 C.E. Near the coast of the Bay of Naples, the site features excavated ruins. It was a thriving provincial center with a population of between 10,000 and 20,000 people. Its narrow streets, made narrower by street vendors and shops with jutting cloth awnings, teemed with tavern goers, slaves, vacationers from the north. A colossal new aqueduct supplied running water from the Lower Apennine mountains, which gushed from fountains throughout the city, even in private homes. It was a wonder to visit this site on August 1st. 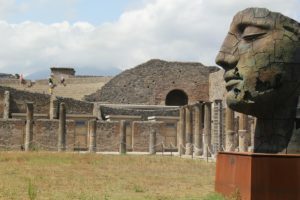 An exhibit of bronze statues throughout the site added an extra visual appeal to the unbelievable breathtaking ruins. 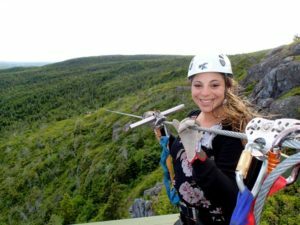 When I heard of a zip lining attraction near Petty Harbour in St. Johns Newfoundland, I was more than excited to sign up! After having had the opportunity to skydive, I thought I could take on any height in the pursuit of adventure. After a twenty minute cab ride to Petty Harbour, I was instructed that I would be the only person on this tour at 6 p.m. 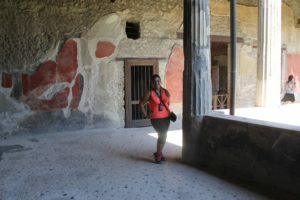 Naturally, I was extremely pleased as I often enjoy taking time to photograph my experiences and that can be extremely difficult with a tour director that is time conscious. In Italy, for example, my guide was not pleased with my selfie-photoshoots at every cobble-stone alleyway. However, the tour guides of NZ Zip Line were actually extremely complacent with my photo habit and in fact asked if they could take some photos of me while zipping! Naturally, I said yes! Climbing up what seemed to be 60 feet of a wood-laid down path, I felt as though I had successfully made it to the top of a beautiful look-out in St. Johns that perhaps most tourists do not have the opportunity to view. I had a birds-eye view of the habour, the wind-ripped Atlantic, and a way off in the distance blackhead mount. I took a deep breathe and let the 60 km per hour winds roar around me. I was told by the instructors that normally when winds reach 70 km, that they do not zip because, depending on which direction you are going, the wind can act as an inhibitor and leave you stranded in the middle of the line. Luckily for me, the instructor told me that to combat the winds, we could go in tandem on the much more lengthier lines to avoid “coming up short.” A practice line is the first of eight. It is rather short in length but really gets your adrenaline flowing. You learn how to break or at least the premise of how to break. When you are a novice at zip-lining, the concept of stopping yourself with your hand becomes slightly daunting. The only thing I could think of was that I may accidentally put my hand in front of the steel wheel and then I won’t ever have that hand anymore. As instructed, you should always put your hand behind your gear, wear strong gloves (which are provided) and a leather breaker (also provided). The concept was one I did not master until the 6th line and then totally forgot about by the 7th. By the 6th line, I really was pro. I slowed myself enough to be able to take in the amazing view! The pines were so lush and green and everything below looked so miniature. The fear of my harness not being tight enough subsided and the constraint of the harness, I had tightened by the instructor more than once, took over. Only later would I realize that some slack would have been favoured as a large purple bruise formed along the outline of my harness. By the 7th line, I was travelling at a much faster speed and of course forgot everything I had learned and barrelled into my “catcher.” His pleasant chuckle had me laughing at myself and apologizing sincerely for not being able to master the lesson. At the 8th line, any hesitation, fear of falling, or impending doom was gone and I was slightly sad that there was not “just one more” line. As we made our way down to the bus to shuttle back to our starting point, I couldn’t help but feel a sense of accomplishment for being able to tackle a line that was over 1 km in length and approximately 200 feet above the ground. Zip-lining is definitely something worth while to do in St. Johns and something that has not only taught me to laugh at myself but also to keep learning. When I first arrived in Tropea, I was under the impression that the little city was very similar to the narrow, cobble stone streets I had walked in Orvieto and San Ginangmo. My family members, however, were making Tropea to be this amazing, enchanted location that most tourists do not have the opportunity to visit. I was excited specifically for this reason, as I had wanted to see more Italian locals and get a feel for what life was like outside of travelling as a tourist. ur eyes on a Gelato shop and as you may have read previously, I am kind of a Gelato connoisseur so of course we stopped! As I ate my Gelato, I was entertained by my Zia who has now almost been wearing her ice cream from the glorious sunshine! We walked a bit further and the smell of pizza was so tantalizing, I was unable to continue without stopping for a bite. 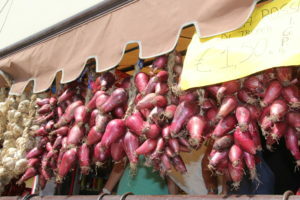 In Tropea, the have these sweet onions, purple in colour and very sweet. The taste of these onions is not strong or overwhelming like white onions, but add a rather sweet, natural, additive to the taste of food. I wish I could have it on pizza more often. The onion has become so well known from being cultivated in Tropea that it bares the name of the location and can be found on souvenirs. After our quick bite, my relatives became even more anxious. 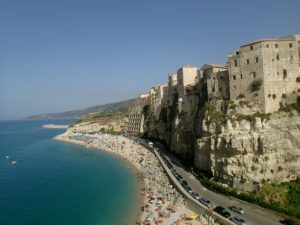 They began telling me that I has not yet witnessed the wonders of Tropea yet and that I should expect more. As we continued our leisurely walk, the shops were beginning to close. It was “siesta” time and shop owners were retreating to their own homes for dinner. At this point, we came out to a look out where I was caught off guard. The sight was beautiful. It was the ocean and I could see a winding road below us that seemed to descend for miles. I had not realized how high in elevation we were. After a photo or two, my relatives then increased my curiosity as they said there was another look out to view. We walked on. At this point, I was ready for the beach. All day my cousins had told me about this beautiful beach and how it was unlike anything I have seen before and they we’re right. In what appeared to be a little walk way, approximately 30 feet wide, was a gated fence. I mean, if you were walking and you happened to blink, you would miss it. We walked up to it and below was the most magnificent site of blue ocean water and happy beach goers. The gated fence was about waist high and overlooked the beautiful, tranquil waters of Tropea. Had I not first been given the tour of Tropea, I do not think I would have appreciated this amazing view. On the gated fence were a series of padlocks, closed, without any keys to be found. When I asked my Zia why these locks were here, her response was “la amour!” “Love?” I was confused. What did these locks have to do with love? Apparently, young lovers who visit this area, will leave a lock to show their love for one another, to be bound together, forever in Tropea. If only, I think it is the equivalent to our vandalism “Bob, was here!” but, so much more romantic! At this point, I was ready to “beach it!” So I excitedly said to my aunt, “how do we get down?” We had to walk back through town to our vehicle and, you guessed it, drive down the winding road. As we got into the water, I immediately noticed the towering hill to my left that housed a church at it’s peak. I asked my Zio to take me to the church. Ironically enough, you could not climb the hill without clothing. Odd spot for a church, on a beach, but when in ROME! As we walked to the top, I sensed a feeling of calm and peace that I had only experienced in the church in Pisa. The church was beautiful. White walls. Elegant statues of both Mother Mary, Joseph, holding baby Jesus. I felt a bit out of place, with my wet hair leaking all over the place, my sandles, swishing water onto the pristine tiles. 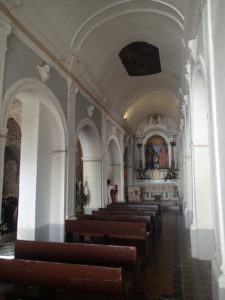 We were not the only one’s in the church with this appearance but after a short prayer, and a dip of my hand in the holy water, I was out on the terrance over looking the beach area once again. The view was picturesque. I can only describe it as magnificent. The beach-goers below appeared to be very small and insignificant in comparison to the vast expanse that was before me. I remember descending the hill with my Zio and thinking how blessed I had been to have visited this Southern Italian city that, I would be lying if I didn’t say a few tears came to my eyes. 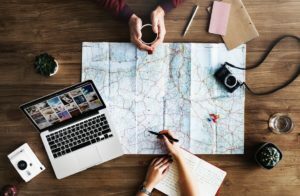 Travelling solo is not only an experience that builds independence but also lasting bonds with extraordinary people that I would have otherwise not have had the opportunity to get to know. For me, traveling solo has been an opportunity to step outside of my comfort zone and do things that I could not do in the confines of my own backyard. As a marketer, I decided to utilize my skill set to advocate for hotels, restaurants, and businesses I have visited and would like others to visit as well. I hope my blog provides you with a first-person perspective you can rely on and utilize on your own adventure, whether solo or alongside good company! Let the travel bug bite you! 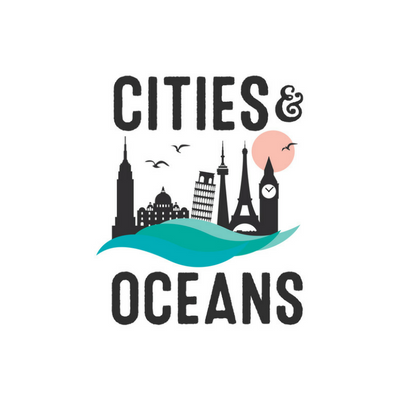 @2019 Cities and Oceans - All Rights Reserved.